Beautiful pork chops served with roasted asparagus - so good! The Perfect Pork Chop. That’s a pretty bold statement, but I feel like I’ve finally got this preparation mastered. The following method produces golden brown, tender, and juicy pork chops that are full of flavor. Alex stated, “This is the best pork chop I’ve ever had.” Enough said – on to the recipe! 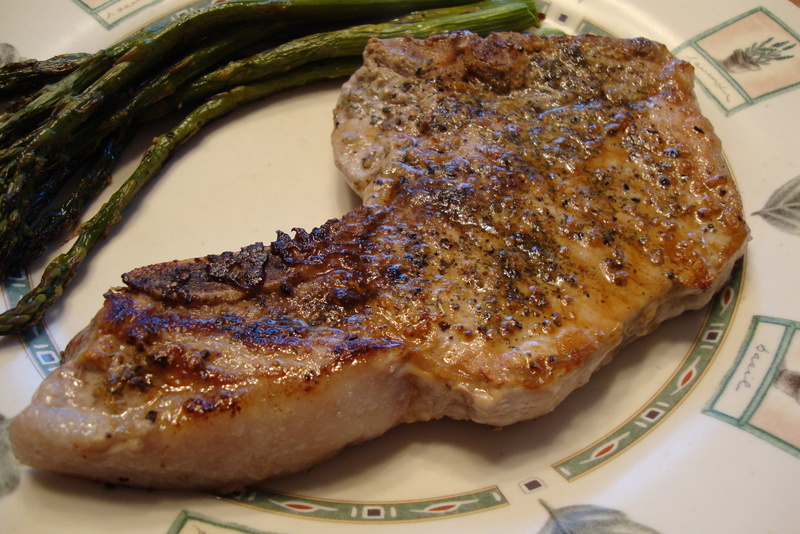 About 15 minutes before you are ready to prepare them, place your pork chops on a large plate or cutting board. Sprinkle them with poultry seasoning, sea salt, and pepper. Let them sit for 15 minutes. While to pork chops are resting, heat a large oven proof skillet over medium heat. I use a large stainless steel frying pan with a metal handle. Melt the ghee in the pan. Using large tongs, place the pork chops seasoning side down in the pan. Leave them alone for 2 minutes. No pressing, flipping, or lifting to check browning! While they are frying, take the time to season the other side which is now face up in the pan. Use the poultry seasoning, sea salt, and pepper again. After 2 minutes use the tongs to flip the pork chops. They should lift easily from the pan. If they are sticking, give them a few more seconds and try again. Let the second side brown for 2 minutes and then transfer the pan to the oven. Let them continue to cook in the oven for 5 minutes. Remove from the oven and transfer the pork chops to a platter or plates. Let them rest for a couple of minutes before serving. This method produced tender pork chops that we just slightly pink in the middle, but were beautifully browned on the outside. Enjoy! This recipe was shared at The Nourishing Gourmet. What tempreture should the oven be?